Single Medical ID Dog Tag, IDNS36 (1 1/8"x2"), is made from .050" thick premium Non-Allergic Stainless Steel Tag. It is guaranteed to be rust free for the life. Red raised enameled medical logo is attached on the front of the plate. You can choose, also, blue or pink color, or plain Dog Tag, without logo. High reflective quality of the Dog Tag's mirror finish is combined with the deep engraving of the medical information. This creates exceptional contrast of letters and high durability of the product, which will provide a good protection for years to come. 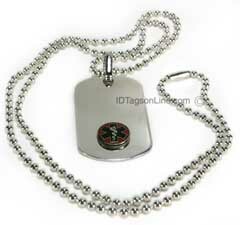 Medical ID Dog Tags are attached to 24" (61 cm) or 30" (76 cm) stainless Steel ball chain. We can engrave 8 lines total (20 Characters Max. in all lines) of personal or medical information on both Dog Tags. It would be 2 lines of the front and 6 lines on the back. To see, how text will be placed on each side, please, click here.